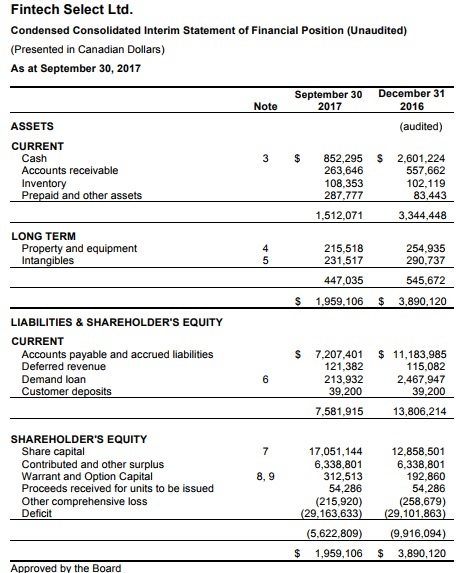 Shareholder's deficit of $5.6 million, a $0.5 million improvement from Q2's deficit of $6.1 million. Current assets of $1.5 million less liabilities of $7.6 million for a working capital deficit of $6.1 million. This is also a $0.5 million improvement over Q2 which had $1.7 million in current assets against $8.3 million in liabilities for a deficit of $6.6 million. 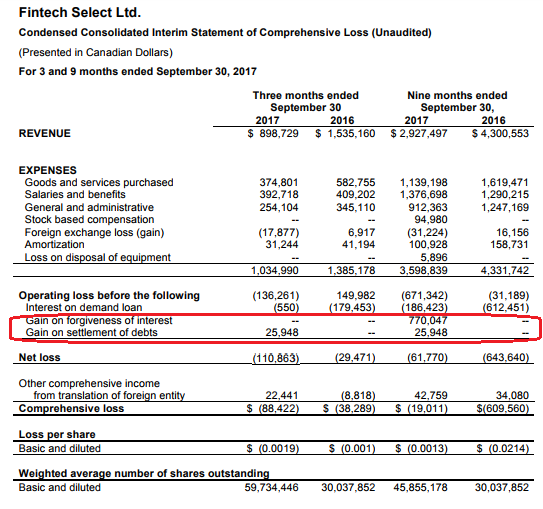 Net loss for Q3 was $110,000 on $900,000 in revenue and the company has been toggling back and forth between profit and losses each quarter (profitable quarters are usually due to gain on settlements of debt). The loss from operations is a little over $100,000 per quarter on average, so it's not like FTEC is paddling upstream against a very strong current when trying to eliminate this working capital deficit. The company has marginally cash flow negative operations that could turn positive in the months after the cryptocurrency point-of-sales business goes live. Share count as of September 30, 2017 was 60.6 million. 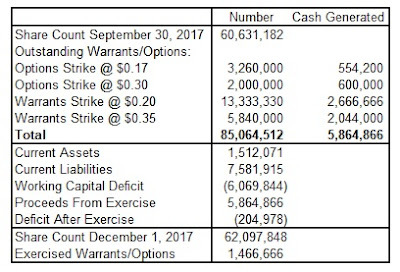 FTEC has 24.4 million warrants and options outstanding for a total fully diluted share count of 85 million. What's great about this is that this is still a reasonable share float given what the company is doing. Glance Technologies (GET.C) has had no problems flying from pennies to over $3.00 on a share count of well over 100 million. FTEC has been recording gains on settlement of debt or forgiveness of interest as part of its goal to improve the balance sheet. This could very well continue which would accelerate the reduction of debt, cover off the $200,000 shortfall after full exercise and cover any marginal operating cash outflow the company may still have going forward. The next issue of course is timing. These derivatives have up to three years before expiry so it could be a while before cash comes in. The options are in the hands of management who can control when they exercise and the $0.20 strike warrants have a provision where they can be called in within a month after FTEC stays at $0.50 or above for 10 consecutive trading days. So close to $4 million could come in within, say, the next couple of months. That would be a huge chunk, enough to pay off the statement of claim made against the company by Home Trust and eliminate that negative overhang on the company. The current share count is 62.1 million, a 1.5 million increase from 60.6 million at the end of September. That means 1.5 million have been exercised during that time period. So expect continued balance sheet improvements going forward at the expense of reasonable dilution.